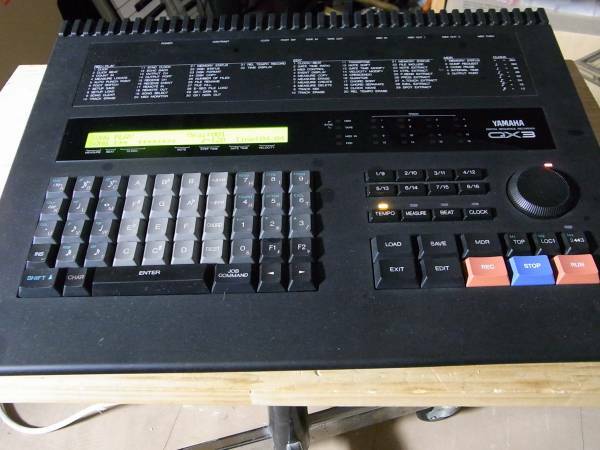 Yamaha QY700 Sequencer – One of the best! Back in the late 90’s I used to work with a Yamaha QY300 quite bit and really grew to like that sequencer. However I sold it a few years ago for a couple of reasons. One was the floppy disk drive had finally given out and didn’t have the means at the time to replace it. I also didn’t particularly like how the LCD screen was not backlit which made it very difficult to work with. 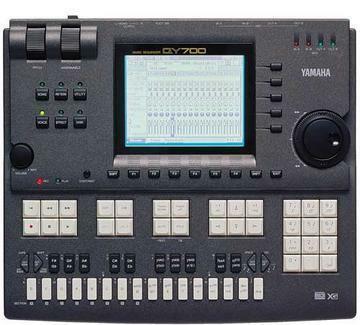 It was a pretty solid sequencer I remember and I also knew that it had a bigger brother called the Yamaha QY700 that I had hope to find one day. Well, shortly after I purchased the Yamaha QX3 I wrote about earlier, I received a call from the Hard Off sales clerk saying he had just gotten in a Yamaha QY700. I had spoken briefly about the QY700 with him that if he had ever got one in to give me call. I was shocked to first get a call, and second to get one so soon. He kind of chuckled and said it was lucky that someone had dropped one off just the very next day after I had bought the Yamaha QX3. He offered me a good price and so last night I jumped back into the car and ran over to pick up the QY700. Now I totally have enough sequencers already, but I there were a few reasons why I really wanted to nab the Yamaha QY700. First, I love the midi connections it has. There are two MIDI in ports and two MIDI out ports which is fantastic. Plus the LCD screen is really nice with full back lighting and a contrast adjustment knob. What a difference a BIG backlit LCD screen makes compared to the QY300. The Floppy disk drive also accepts both DD and HD disks while the QY300 only could use DD floppy disk. Plus the QY700 can save or load ESEQ formatted songs which means I can now easily create tracks and load them into the Yamaha QX3. Or I can create tracks on the QX3 and then load them up on the QY700. Pretty cool! The built in XG sounds in the QY700 are not all that bad for creating your songs and you can always control an external sampler or sound module to improve the sound quality. I also found the effects inside the QY700 to be really nice. There are some effects such as “early reflections” and “symphonic” that are popular in the Yamaha SPX and FX series effect modules. It’s too bad there’s no effects loop to apply the effects to other sound modules, but it’s still nice to have them for the XG sounds. The real beauty of the Yamaha QY700 is in the sequencing. I primarily hang out in pattern/phrase mode where I like to create sketches of grooves to be used in songs later on. It’s incredibly easy and quick to lay down multiple tracks. In the past I’ve used a Yamaha RM1x and RS7000 which are both just as fantastic, but having that big LCD screen is a big bonus when trying to get an overview of your entire composition. Another feature I really like about the QY700 is that when you power off the sequencer, it retains all of the songs, patterns, and phrases in memory. You don’t lose a thing! The Rm1x also does this which is why I like that sequencer as well, however, the RS7000 does not do this. Personally it drives me nuts having to load up my sequences every time I power up the RS7000, so it’s nice with the QY700 not to worry about that. The timing on the Yamaha RY800 is also rock solid. The Quantize and Groove template editing is outstanding. Yamaha really makes excellent vintage sequencers. The Yamaha QY700, RM1x, RS7000, and others are simply wonderful to work with. Although I really like my Rm1x, I probably would have to recommend the Yamaha QY800 over the Rm1x simply because of that LCD screen. It’s great just to be able to view everything all on one screen. If you see a Yamaha QY700, definitely check it out. Yamaha QX-3 80’s sequencer powerhouse! This morning I found a Yamaha QX-3 Sequencer for $10 bucks at the Hard Off used music store here in Nagano-city, Japan. ( Like the one in the photo ). I’m so excited about this because I really like this sequencer for it’s basic approach to sequencing. The program keys are awesome and there is very little if any menu diving. Everything is all spelled out in front of you and once you get the function keys down, it should be super fast to record. Yes, it’s old and big, but it works very well and for the price, it’s difficult to find a better one. Although it has the E-SEQ sequencer format rather than saving to MIDI, there are two outs in the back and it’s pretty easy to dump the tracks if necessary. There is also a DD floppy disk drive which works well. The LCD is backlit and all of the keys along with descriptions are on the face of the sequencer. There are also two midi outputs which is great, plus the recording /quantize resolution is very good. According to the manual it was paired up with the Yamaha RX-5 drum machine and DX7II keyboard when it came out. The QX-3 is also built like a tank and seems to be very reliable if played on stage. I first learned about the Yamaha QX-3 from Synthfreq which I posted a video from below. I don’t believe she has it anymore due to some gear lost in a fire if I remember correctly. She posted about it a while ago. Synthfreq uses the Yamaha QX-3 to play the back tracks in the video linked below. Since then I’ve been on the look out for one and was pleasantly surprised to find one in mint shape at the store today. Needless to say I grabbed that puppy fast! I love this little sampler. I also have the Korg ES-1 MKII which is the same except for the color and one of the effects has changed. These samplers are fantastic for creating vintage drum kits and early 80s/90s grooves as in the video link below. The Korg ES-1 was quite often found in Japan but lately it’s getting more scarce. The one I found today was at a rock bottom price and so I couldn’t pass it up. The step sequencer and motion sequencer are also classic on this and I really enjoy how it programs. If you ever come across one of these at a good price, I seriously would pick it up. It’s so simple to use. I believe the sound quality is at 32kHz if correct which is great for those vintage sounds. Samples are pretty easy to get into the machine and there are enough slots for some good kits and variety. I tend to put my old school samples in the ES-1 from E-MU, Roland, Ensoniq, and Akai. These work great but you will need to convert them to WAV first before dumping them onto a 3.3V Smart Media card. In addition you will name to rename the samples numerically for them to work. 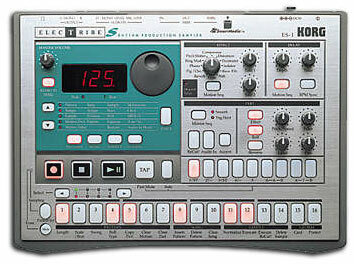 The Korg ES-1 makes a fabulous drum machine and percussion back drop to almost any sort of music project. I highly recommend it!! Today I was browsing through the used music shop I frequent here in Nagano-city, Japan and stumbled upon on something I’ve never seen before. Someone had just this morning dropped off an Akai EWI 3020 wind controller and cable along with two modules. One was the Akai EWI 3020M Analog Synth Module and the other was the Akai EWI 3030M PCM Synth Module. In addition, all of the manuals, cables, and even a hard shell case were included. Everything was in mint condition for $200 bucks total. These are likely to be popular in Japan simply because it’s difficult to practice any sort of wind instrument in homes here because of the close proximity to neighbors. I also thought it would be fun to see how if at all I can “think outside the box” with this and use it with my other synths. It would be fun to try and see if I could play anything decent as well. Not to mention, both of my daughters may find it fun and inspiring to try and play, especially since you can use headphones. If all else fails then I may just end up selling everything. Obviously the sales staff had little knowledge of what they had with this Akai wind synth setup. It’s old technology but it’s exactly what I dig as an Old Skool sort of musician. I enjoy trying to make new uses of these things and since I’m no sax player, I may be able to find some cool ways to use it. I’ll post some additional thoughts after I work with it a little bit. It may just be extremely difficult to altogether. 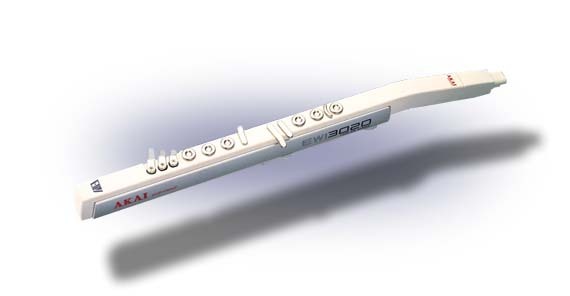 I’m also curious how if at all you can use the Akai EWI 3020 to control other synths. There might be some interesting midi controller aspects. Stay tuned! 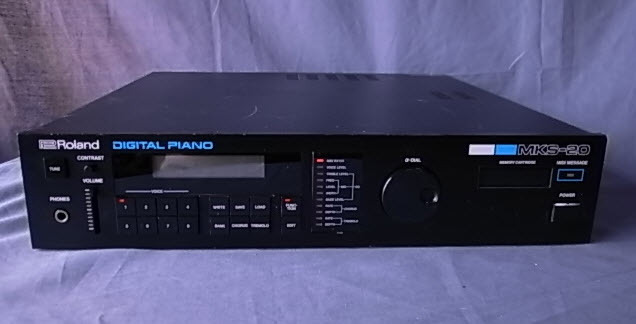 I just scored a vintage Roland MKS-20 Digital Piano Module today from a good friend in Nagoya, Japan. I’m really excited about this because I’ve been dealing with MKS-20 multi-samples for some time now with just ok results. I can now finally get busy with the real thing and do some sampling of my own if I wish. In Japan, the Roland MKS-20 is pretty hard to find and we all know it can be quite expensive to get one off Ebay. I got a very good price for this one and feel it should serve me well now and into the future. As I mentioned I have tried quite a few MKS-20 Sample sets but they always seem to be lacking to me. I also noticed that those who created the samples have never really gotten rid of their MKS-20 modules at all, so I figured samples would never really beat the real thing. Why would they keep their MKS-20 module then? Incidentally, I recently passed up a working Roland RD-1000 keyboard for $60 bucks at a local used shop here in Nagano-city. The reason primarily was the thing was HUGE!! I mean I really didn’t have the space for this beast of a piano at all and it drove me nuts that I had to pass up such a deal, but oh well. I have acquired a lot of gear but the RD-1000 was just too darn big to have sitting in my room and I really didn’t want to put it in storage. So I passed it up and kept waiting for the day I would run into a Roland MKS-20. Sure enough about three weeks later I found one and it’s on the way! I did take some pictures of the Roland RD-1000 I found earlier and will post them here shortly for those curious about it. Currently they are on my cell phone which is out in the car. In any event, I’m finally glad to have found the elusive Roland MKS-20 in full working order here in Japan. I really like the sound and will enjoy working it into my current setup. Samples are good, but I really think the real thing is better in this particular case. I only wish I had saved the money I spent on the samples…laugh. Here’s a quick video demonstration of the Roland MKS-20 Digital Piano Sound Module found on Youtube. Recently in Nagano-city, Japan I’ve noticed a lot of young kids, especially girls, interested in performing music on stage. Having two young daughters myself and a ton of music gear I decided to donate some of my time to helping kids get bands together in Nagano-city, Japan. In most schools around Japan there are no talent shows, rock schools, school dances, proms, events, or anything special to help kids learn pop/rock music and perform on stage. So, like most things I do in Japan, I have to create my own events and then market heavily to help attract interest. Fortunately I have become good friends with some Nagano-city area producers and bands who are willing to help out with providing stage venues and sit in where needed. In addition, we are offering lessons in guitar, synthesizer, piano, bass, drums, and vocals for those kids who need new or additional training for the stage. If there are any foreign expats or music enthusiasts in Nagano-city and are interested in some jam session fun, please contact me. Nagano city is a samll city in Japan but like most cities around the country it has a very large interest in music. The scene is mostly underground but hopefully we’ll be able to provide a means for kids to gather and perform Rock, Pop, Blues, and Jazz Music. I have been working with my newly rejuvenated Roland S-50 sampler lately and thought I would create an article here about things I’ve encountered while sampling. These may or may not be tips or techniques of a special nature, but they may help those in trying to figure out a good workflow when using the Roland S-50 Sampler. I’ll start by writing some random thoughts about my experiences thus far with Sampling on the S-50. Please comment if you have any tips or experiences of your own that may be of use for either practice or in thought. Lately, I have been skipping the WAV import using the computer directly to the Roland S-50. I find this to be time consuming and there doesn’t seem to be any software that works all that great. What works for me is to use one of my old Roland SP-808 samplers to store “one shot” sounds of various analog synths. For example, I have one 100MB Zip disk divided in banks with MOOG sounds. Each bank is title something like A-B-F#-G# where each letter represents a row of SP-808 pads with MOOG one shot key samples. This helps me to set the correct root key on the S-50. I then run the SP-808 out to the input of the S-50 and record direct. You could use virtually any sampler, but I have found my trusty old SP-808 to work well. Of course I have to use the WAV converter for the SP-808 to initially store samples, but then I can really fast play a pad and record onto the S-50. Note I don’t wish to tether a computer to the S-50 at this time. Another thing I do a lot is record with 15kHz instead of 30. Beside getting more sampling time, I find the sound difference to be minimal quite frankly. This allows me to record lots of samples into the S-50 no problem. Of course I can use 30kHz or vary the sample lengths but I have found lowering the frequency to be very helpful. Also, since I mainly record one shots I don’t have to worry about looping or recording longer samples that much. I usually set the gain and rec level as high as possible. When I dedicate my SP-808 to the S-50 I can keep all the volume settings the same which allows me to keep the samples similar in volume. I then just pop out the zip disk run to the computer and load more samples for recording if need be. I also find I like to record and create construction kits on the S-50. Thus I may have a series of zip disks categorized by drums, basses, guitars, synths, etc and then record the instruments I want to use for a particular construction kit or song. Basically I prefer S-50 disks to contain construction kits and my SP-808 zip disks to contain specific instruments. I find it takes me about 30 minutes to fully sample a new construction kit for creating a new song. I then save that kit onto a floppy disk for later use if needed. I have found setting loop points on the S-50 to be rather difficult. I do find the auto loop function can work pretty well at times, but it’s often time consuming to bang out perfect loops so I mainly use the S-50 for one shots and then use the envelopes for tweaking. I first figure out whether a song instrument will require a long decay or not and then sample accordingly. If my Moog sound will be short and staccato like then I’ll sample 0.4 or 0.8 (x2 @15) and then just play my bass line. If I require a long decay I’ll simply record at .8 or 1.6 (x2 @15 ) instead of looping the sound. I have found that looping the end of a sound can also lower the tone or quality of the main sample for some reason. Thus if I don’t tamper with the sample and just play it, the sound is awesome. I do like to layer or use envelopes which works very well. Sometimes I get the message “Not Execute” which took me a while to figure out that I was either missing a parameter under record or had an incorrect value. I found my sampling time was most often written incorrectly. If you get this error it simply means “carefully” check your entered values and correct the one that is not right. All in all, I find sampling directly to the Roland S-50 to be rather painless and quite fun. If you sample to create a song construction kit then likely you’ll be able to enjoy the S-50 right away after you finished sampling your initial samples for the song. You can then quickly create your patches and then use Director-S to record the song. Then save the song and sound kit onto an S-50 disk and you can later use it for other songs. As mentioned I also find using an external sampler for storing samples to be very useful. You can then just hit record on the S-50 and press a pad on your external sampler with tons of samples available at your fingertips. On the computer I find myself “thinking” in terms of construction kits rather than filling up an S-50 disk with MOOG bass samples. It then becomes a fun and a rewarding challenge to use that sample construction kit to create a song. I remember back in the day people having contests where a each person would have a floppy with the same construction kit on it. They then had a month to create a song and then everyone would vote on the song they liked. That used to be really fun because it put the song writing back into music rather than nowadays where people seem to want massive sample collections. The Roland S-50 is limited by today’s standard samplers, but I personally find these limitations inspire me more to create and play songs. The Roland S-50 “can” have plenty of polyphony and memory if you accept the limitations and just get down to writing a song with what you have. The old cliche “Simple is Best” can be true sometimes. Soon I’ll be creating some videos based on constructions kits that I sampled for the S-50 and how I use these to create fun songs or sketchpad ideas. The Roland S-50 sounds fantastic and is really fun to play. I also find that any sound I sample into the Roland S-50, I can easily convert to any other format such as the S-550, S-330, W-30, or S-760. That’s not always the case the other way around. 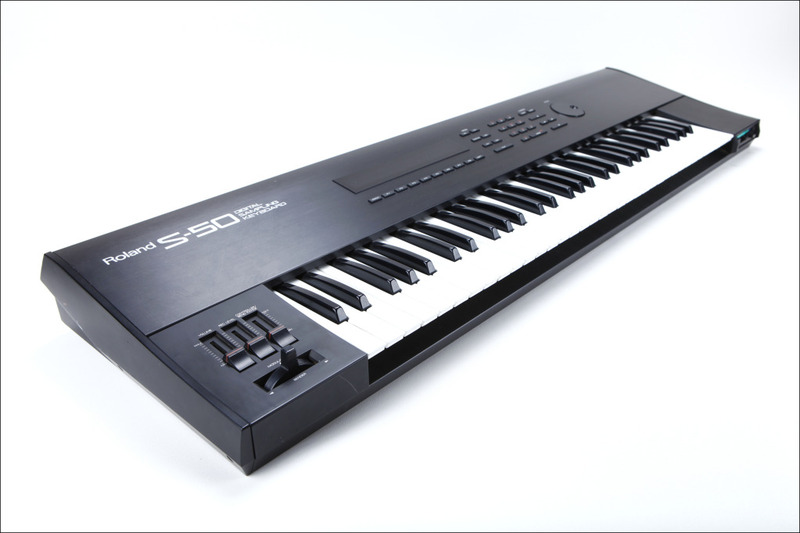 Stay tuned for more thoughts and updates as I dive deeper into the Roland S-50.